Ever imagined how would it be to get a massage in space? Weightless and Peaceful, right? Thanks to zero gravity massage chairs this is not a dream anymore. With zero gravity position you can literally escape gravity in your own room. Reclining into a zero gravity position alone has many benefits like reducing strain of heart and muscle tension; when combined with massage can undoubtedly benefit your body in many ways. Because when your body is as relaxed and stress free as it is while in zero gravity; any massage you’re having will be 2 times more effective than in a normal reclining position. It’s so relaxing and soothing that many customers have reported that they end up sleeping after a 15 minute massage session in zero gravity. If you want to experience zero gravity on earth here the best zero gravity massage chairs of 2015 that you can get your hands on. All of the chairs below have been chosen not only for their awesome massage capabilities, but because all of these have 2 zero gravity positions which makes them the best zero gravity chairs. 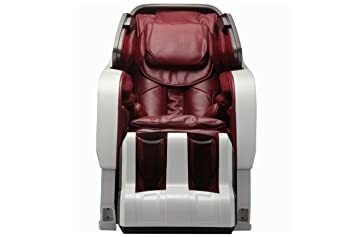 Most of these chairs are very expensive, if you’re short on budget and want something below $1500 then make sure to give best massage chair recliners of 2017 a visit. The Osaki Os-6000 is one of the most budget friendly chairs in this list in spite of it having features that are seen in way more expensive chairs. 2 zero gravity positions adds a lot to the chair, but that’s not all. The chair supports 3D massage which is a term that defines the movement of the Quad rollers. While normal 2D massage rollers go “up and down” and “side to side” the 3D technology makes the rollers able to go “in and out” making it a 3D massage. This 3D massage is performed with S-track which follows the curvature and structure of your spine. 3 Airbags along the shoulders inflate in an inward squeezing action providing outer shoulder massage. One of the best features I like in this chair is the music synced massage. The chair can sync with your ipod or smartphone to adjust the vibration massage just in rhythm with the music you’re listening to. The foot and calf massager scans and adjusts itself for a perfect fit and to make sure that the airbags are on the right place. The foot and calf massager is also used as a stretching tool. The stretch modes include; Forward and Down stretch. Other features include hip and pelvis massage (with airbags), hand and arm massage, neck massage (airbags + rollers). Infinity Iyashi was the first chair in the market that introduced a massage stroke as long as 49″ which is now known as L-track. The L-track robot is considered better than S-track as it not only follows the “S” shape of the spine, but also goes ahead to the buttock and glutes area making it L-track. One of the unique features of this chair is “The Posture Correction” which despite of being a necessary thing in our life to be corrected isn’t included in many of the massage chairs. So how does the chair improves your posture? Simple, the airbags compress the front of your shoulders and pin them against the chair back to get your body back in to its natural posture. The chair has a sliding base which saves a lot of space especially when the chair reclines in to a zero gravity position. Which means even if you place the chair an inch away from the wall it’s not going to make contact with the wall. If you suffer from back pain, the waist twist option is for you. The intense motion generated by moving your hips side to side will prove to be a blessing for even the most acute back pain. 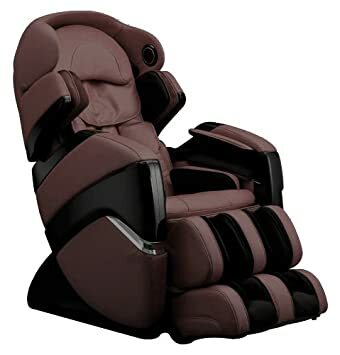 Just like the Osaki OS-6000 synchronic massage is also supported in this chair. Unlike other chairs that get noisy with airbags inflating and back rollers in action the Infinity Iyashi is designed to maintain the lowest level of noise to provide the best peaceful and comfortable massage. Kahuna might not be the world’ most known massage chair company, but has definitely started to leave its mark by launching chairs like this. The one sentence description of this is: The best high-end features for the best price. Like every high-end massage chair listed in this list, this chair also supports 2 zero gravity positions. The chair has an L-track robot that extends its Quad roller reach from the neck to your buttocks while in majority of the chairs you get airbags to deal with lower body problems. The foot massager comes in with foot rollers which can be combined with heat to get the best results (Heat massage is also available for lumbar area). The full body computer body scan identifies your body structure (for a personalized massage) and identifies which areas are in need of a massage. It has wheel casters for improved mobility. Other features include Air massage technology, air pressure massage, Shoulder, Lumbar, Hip Squeeze and adjustable shoulder position. All of this in a budget-friendly price. The chair has a 3 year warranty which only includes labor for the first year. To learn more, read the full review of Kahuna Massage Chair LM6800. 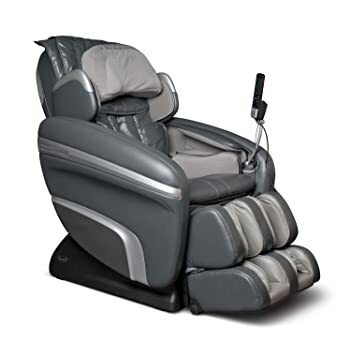 The OS-3D Pro is one of the most feature packed massage chairs from Osaki. The chair comes equipped with the 3D massage technology that works in co-ordination with the full body scan to make the quad rollers able to adjust the massage according to your individual needs. There are six massage types that can provide accupoint massage from neck to your lower back. These massage types include Swedish, combination, deep tissue, kneading, and shiatsu that target acupoints with great accuracy. The foot rollers make this chair one of a kind as its got 2 rollers per foot while others only support one. Osaki has engineered a new kind of air massage technology which they call “Next Generation Air Massage” that uses less airbags, but still covers every inch of your body parts. The way it benefits your purchase is that it puts less stress on the hardware making sure that it lasts the test of time. 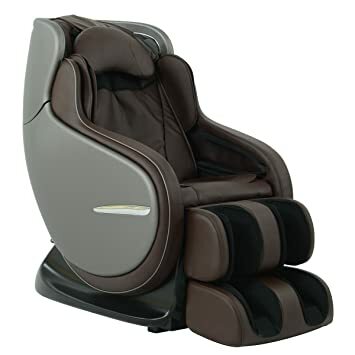 The chair do comes with one of the most popular features in massage chairs which is the extendable ottoman that automatically scans your body to adjust yourself in it perfectly. 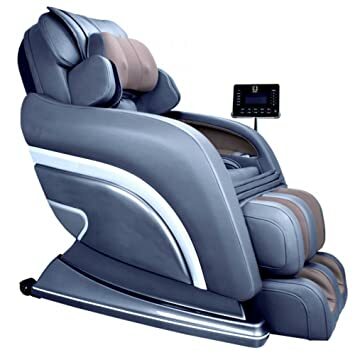 To ensure the best peaceful and uninterrupted massage the reclining positions, leg rest and foot extension can be controlled automatically through the screen without putting any kind of stress on your thighs or back. The inflating upper body airbags can perform shoulder, lumbar and hip squeeze/twist. The technique used here makes use of the hand air bags the keep the arms at their place while the chair reclines back and the ottoman goes down making it an intense stretch. Another chair that supports 2 zero gravity positions. If you’re asking: What’s so special about this one. The first thing that deserves a mention is its full body heat massage. It’s got heating modules for the back, seat and foot massager with full control of turning heat on or off for any particular area. The Omega Montage pro has the world’s most feature studded leg rest. The reason I’m saying so is because not only the foot rest has airbags and foot rollers (with 3 speed levels), but a special magnetic massage is integrated into it to provide the most complete foot massage that heals soreness, aches and pain in your soles. The chair has 4 back massage courses to let you pinpoint where you want the chair to massage your back. The courses include: Whole Back, Thoracic (shoulder), Cervical (middle back) and Lumbar. The airbags in this chair deal your body problems with the air pressure technology. This massage technique is developed to copy the action of a professional masseur when squeezing, holding and releasing. The intensity of air pressure massage can also be adjusted up to 5 levels to your desire. The rollers automatically adjust their width to your body type. Though, you can manually change their width to narrow, regular or wide. When it comes to zero gravity massage these chairs are the best in market because of their 2 zero gravity positions. As I always emphasize, that a perfect massage chair for you is the one that fits you budget and needs. Know what you want out of a massage chair, and then choose the perfect product. In my opinion, the Kahuna LM-6800 and Osaki OS-6000 are the most budget friendly chairs with features that make a chair perfect.